Thanks for the great work on Digikam! Since you discussed a new database schema and more metadata, I was wondering if this is all being stored (and searchable) using Nepomuk and Strigi or if Digikam is maintaining its own database? It would be great if all metadata in Digikam, including tags, ratings, as well as camera information, could be shared with the rest of the desktop. For example, Dolphin now has tags and ratings for files. For pictures, this should be the same ratings you see in Digikam, or whatever other photo application one might be using. I'm actually wondering the same thing about Amarok. This is the kind of integration I look forward to seeing throughout KDE 4. Re: Database? Metadata? Strigi/Nepomuk integration? Nepomuk integration is planed for the future, but it's not the priority actually : it's time to stabilize source code to be able to release for september. I'm sorry to hear that. Please reconsider as it is one of KDE's key features to offer broad integration. It is one of the features what makes it shine compared to other Desktops. 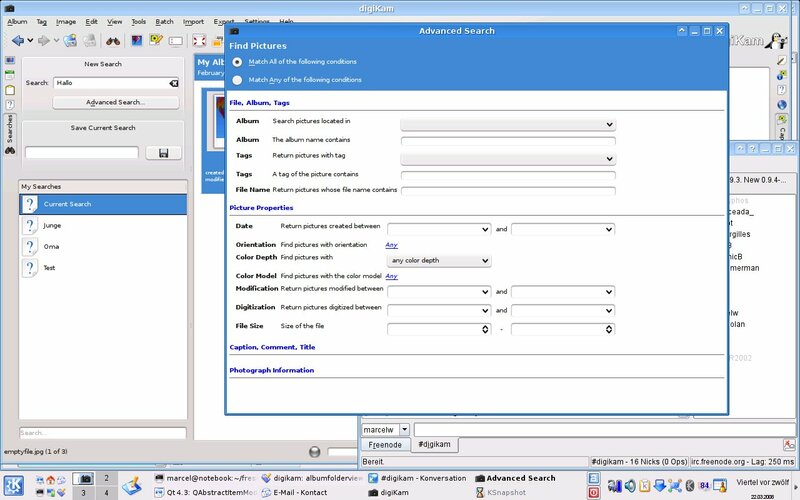 Database applications like DigiKam should promote this feature as soon as possible. DigiKam on the other hand will only gain in importance, insight, influence and momentum. I dont see reason to horry nepomuk integration. I think digiKam has great handling with photographs with it's own ratings and tags. Later nepomuk support would be nice but now I dont see any reason for it. Because I dont see Digikam as a tool for "normal joe" who just browse wallpapers and other images what avarage joe downloads from internet. DigiKam is for professional/hobby photographers , who keeps digikam running anyway when needed to handle big amounts of photographs and easily to manage those. Later that nepomuk integration can be nice but.... Mayby I'm just wrong person to judge that with my photograph library what includes tens of thousands of photos and browsing those with nepomuk sounds bad because I need to have tags and comments on photos and albums what I dont want to find when doing desktop search. No need to hurry indeed, BUT... ther are at least 4 people requesting it (read "KDE 4.1? ", so you are basically the only one who thinks "browsing those with nepomuk sound bad"
As for Nepomuk integration, I'm really waiting for that as well, because I understand that it will not only offer the infrastructure to do the indexing (tagging) and allows for the same lightspeed categrization and search we are used to with digiKam, but also allows tight integration with other apps in the platform: marble with the GPS -data, akonadi integration etc. So far my major reason for not using digiKam to its full capacity has been the problem, that its not se well integrated with the desktop. For example, I have some 6,000 photos, for which digiKam is great editor, but I'd like integrate a hoard of non-photos with slightly different needs to the same system. And I want to tag them all, and I want to tag audiofiles and keynotes in the same system. Somehow I just don't see why I should manage my .mp3 and .xcf -files with digiKam. And if I have to tag these all, why use digiKam. It's a fine editor but lacking integration keeps me from using it more. I would think that from the developer's perspective using existing tools is a good idea, because then one can concentrate on the essential. From the user point of view being able to swicth from one tool - digiKam - that is great for one thing, to another, say Dolphin, Marble or Gwenview, which has different strenghts, is a motivation to use the stuff. At the moment the issue seems to be that XMP is malformed RDF, and thus 1-10% of the XMP metadata is in danger of being lost in conversion to RDF. The sooner we get a uniform access to the metadata, the better. Therefore I really look forward to integrating all these great new digiKam features into the wider desktop, so that I can keep on using it when the stable KDE4 release comes out in the fall. What I fail to get is why it is important that applications ship with KDE4.x. Yes, but you lost the advertising of a full release. And worse, you can miss the release of digikam if you are not trakking the web or similar. Looking at the photos, I am very impressed on the work of digikam. Will Digikam make it into the release of KDE 4.1? They said September and I thought KDE 4.1 was due in 2 months but I could have my dates wrong. lol. And freaking great work, Digikam pops with the black color scheme. Neopumuk : see my previous comments about this subject. many digikam from today can do this feature ! , would this be possible ? I vote for Nepomuk, too. It'll make DigiKam smaller, and better integrated. x2! It would be a great addition! 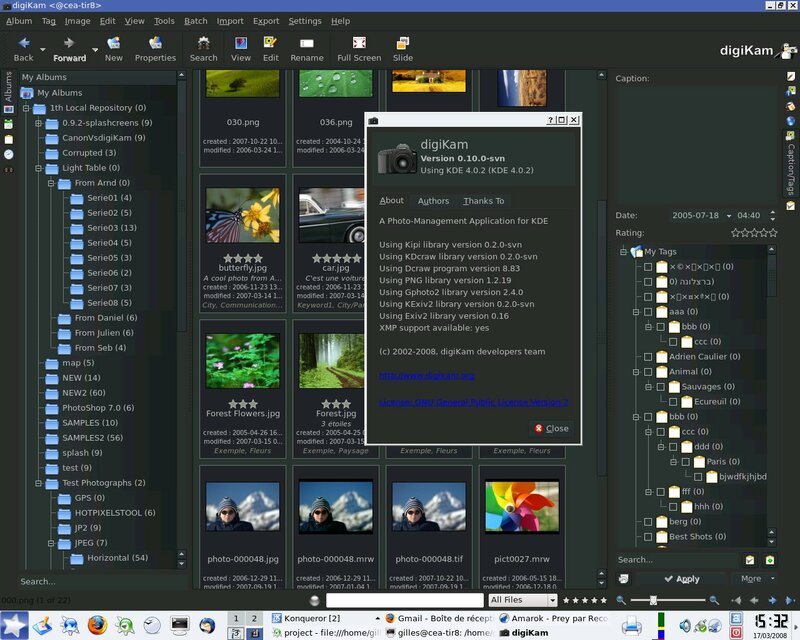 >Will Digikam make it into the release of KDE 4.1? Meh, completely fine with me. I rather you finish the development then release it too early. I'm not a fan of the release early(when buggy) and release often(when should've been released). The #1 thing I'd like to see in Digikam is some form of version control, that lets you go crazy and touch up your pictures while preserving, at least, the original picture. These issues were discussed at length here, but all that came out of that particular bug was a confirmation dialog when saving an image from the image editor. Don't laugh now, but this is the most important thing that is keeping me from migrating my parents to Linux. Here is the scenario, that would apply not just to parents but to any user lacking very strong self-discipline: They find a picture that they like, so they fix it up a little. Apply red eye. Crop it. Tweak the colors and contrast. Make it look better on the screen. That's what Digikam invites you to do. Now they decide that they *really* like the picture, so they ask me to come over and help them make the most of it for printing. And then it is ruined, because of the sloppy, lossy editing that they already did. And that's not their fault, imho, but that of the software that is too unforgiving. That is planned as "next big thing". 0.10 has already so many great features that need testing, testing, testing. Versioning thing has to be rock stable and reliable, it will require much effort. Honestly, if you guys need RAW users to jump onto digikam, then you need to learn why on earth one uses RAW. The way digikam works on RAW files is plain wrong. You are planning all this for the average shooter, but the average user doesn't use RAW, because he/she just doesn't need the overhead of work and diskspace. Those that do use RAW, honestly, don't do autowhitebalance. One ofthe main purposes of RAW is precisely being able to manually correct white balance when the camera's autowhitebalance goes wrong, being able to fix highlights and shadows, curves... without loosing quality "thanks" to the camera's extra processing. First, I read "it's not bad!". Well, it is bad, real bad. The left shots from digikam are washed out,flat, not contrasty at all. Lightzone one looks properly exposed and all lines are rather defined, contrasty. Then, I wonder why you had hidden the righthand toolbar from lightzone. I'd love to know how you are comparing results, ie, what you exactly did to them, why Lightzone gets it right and why showfoto didn't. So the issue is only about accuracy? No. 1) Digikam opens the raw photo applying the _settings_ found n the digikam menu. If you, like most photographers do, are processing 800 shots and each requires a different setting, you can't go and change the digikam settings in the menu each time you want to open a file, it's toooooo slow. You can't just apply a default white balance and then set white balance _again_ in showfoto. You are doubly processing the image and thus loosing quality. 2) When tweaking raw files, precission is also important. One needs to tweak images once and again until one gets it right... apply sharpness 1, 1.1, no, 0.9... if I wanted to do this in showfoto, it would require me to process->undo->process->undo->process->undo each time, and each time opening and closing the dialog from the menu. Really slow. 3) It'd take me a whole month to process 100 shots using digikam/showfoto's procedure shown on the previous comment. The average raw shooter takes around 1000 shots for a session and needs to process those in a single day, not spend a whole month on it. it's about fast batch processing. If it were this slow with any other apps, people would end up using jpeg instead. So honestly, if you want to do RAW, you guys need to learn what RAW is for, and how real users use it. Showfoto coders seem to ignore users here, unlike other opensource projects around. "Then, what's wrong? digikam's workflow to process RAWs is all wrong, and anyone using RAW workflows should possibly know why. I give a couple hints in the following lines:"
I would like to see rawstudio ideas taken to DigiKam's RAW editor, where you can have thubbar (already) showing all images and then make a three different versions from one image and fast switch them to see if one is better than other. And let this window/application to mark those good versions and then apply it to images what are in database. I like the idea that first user just imports images to database, add's few info like albumb name, and then from database, is started the real RAW processing where user open all images and can set one setting for all or process everyone with own custom settings. Mayby biggest "flaw" what i can find from digikam is it's editing window, possibilities are GREAT but own window for every edit function and preview window is small by default etc. Mayby i would do somekind mockup for it. If would be possible to get showfoto work so it's editing goes in it's own window, or is it somekind technical limit? Also common, even on the still-baby rawstudio, that you can copy paste settinsg from one photo to another leaving the raw file untouched, and without generating the final jpegs yet. > First, I read "it's not bad!". Well, it is bad, real bad. The left shots from >digikam are washed out,flat, not contrasty at all. Lightzone one looks >properly exposed and all lines are rather defined, contrasty. ==> the preview of JPEG image embeded in RAW file. No auto gamma/Wb are set here. The image is displayed as well. ==> the RAW image decoded in digiKam with 16 bits color depth + auto-WB + auto-gamma. It's look very similar no ??? >So the issue is only about accuracy? No. > Then, what's wrong? digikam's workflow to process RAWs is all wrong, and >anyone using RAW workflows should possibly know why. 1/ a fast way with all auto settings for less important pictures. Both are possible in digiKam ! >So honestly, if you want to do RAW, you guys need to learn what RAW is for, >and how real users use it. Showfoto coders seem to ignore users here, unlike >other opensource projects around. >==> the preview of JPEG image embeded in RAW file. No auto gamma/Wb are set here. The image is displayed as well. okay, this was confusing. Certainly embedded jpeg files cannot be compared to a processed image. Even slower?? The process about processing RAW is slow by itself. The point is making it fast by applying a proper workflow. Btw, I tried that plugin, I hope you get it right, since it wasn't doing anything last time I gave it a test. If you are using RAW on a daily basis, you sure noticed the way digikam works with RAW files isn't usable. I was questioning you guys on why you follow this way of coding. You know (since you use RAW often), that it's not comfortable. Just too slow for a daily usage. Right now there are much better free alternatives like rawtherapee, ufraw or rawstudio for this task. I myself even, and other coders (yes, I do code, and I have done code for digikam), have addressed at you issues in the past and even offered code for doing a proper RAW workflow. But you seem to ignore all of us. Why so? If you really want to promote RAW in digikam, maybe some tweaks must be done and help from others offered in the past accepted. > I myself even, and other coders (yes, I do code, and I have done code for >digikam), have addressed at you issues in the past and even offered code for >doing a proper RAW workflow. But you seem to ignore all of us. Why so? > 1/ a fast way with all auto settings for less important pictures. Though I don't buy into the previous guy's harshness regarding workflow, I tend to agree that digikam basically lacks proper workflow. - can digikam generate cache (full-size previews) so that a picture would not load every time from a RAW file? - can digikam copy/paste processing parameters? - does digikam allow non-destructive cropping/straightening/WB/etc. with batch export? Well, I'd say - "no" to all of the above. This is a pity. 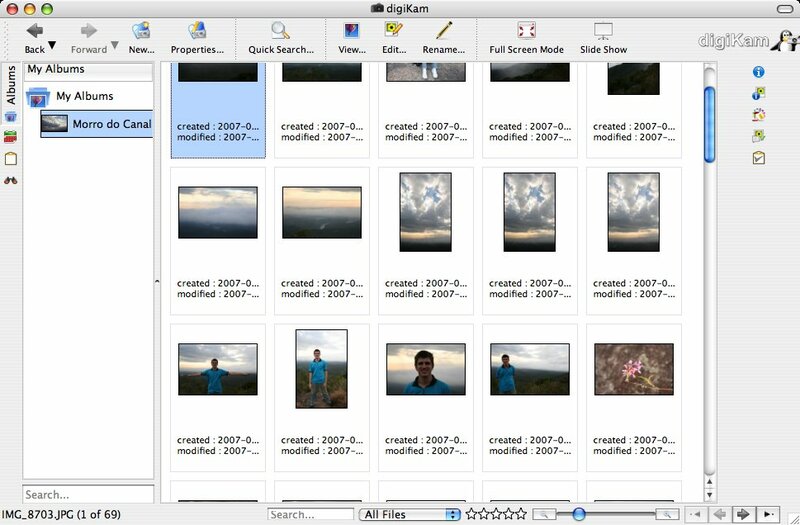 Seriously, digikam has most of pieces in place to become a great RAW workflow product. It just needs better UI + some functionality. Currently I'm bound to use Rawstudio for sorting, UFRaw for actual processing and F-Spot for managing the library. This is a nightmare. This should be stopped. Have you asked KDE e.V. for sponsorship? And if the e.V. board declined (and if so, I really want to know why! ), the LGM organizers themselves? They are now holding a big donation drive to be able to sponsor as man developers as possible: http://pledgie.com/campaigns/613. If it just the money, please ask the KDE e.V., Boudewijn Rempt (Krita) is sponsored by the e.V. too. I thought Amarok was rewritten from scratch for version 2.0. Please clear it up. Maybe even a separate Amarok update post. I'd rather see false rumors floating around Amarok. A lot, and I mean A LOT of people are waiting and looking forward to this great change that is Amarok 2.0. Quite a few people on campus are predicting that it will be BIGGER THAN WINAMP used to be before AOL let Winamp fall by the wayside. I meant "I rather NOT see false rumors floating around." what are the plans on gallery integration plugin ? Well, I've had a hard time of it of late and there has been little progress. I apologise for that. It's still somewhat in flux to be honest. With KDE4 there are so many new techniques and technologies that I'm really struggling to work out the most appropriate way to do this. I've raised a couple of questions to other developers in the past about the use of such techniques but I've not had a huge response (not that I've really pushed it hard as I have not got the time right now to do much about it anyway). My current lines of thinking are such. 1) I want a nice sync framework that goes beyond Gallery and applies to other web services e.g. Facebook, Flickr etc. etc. as well as e.g. a file or a CD ROM for achieve. The principle is in itself applicable to a lot of things. 2) Other approaches are out there and I want to make sure myself (or others) pick the right model for this with regards to Digikam/KIPI and (more widely) KDE4. A good example of this is Conduit. It is a separate program aimed mostly at Gnome (although there is some vestiges of a Konduit project, it's pretty hard to find out any info about). It integrates to libopensync and can upload FSpot pictures to e.g. Flickr and Facebook etc. I quite like this approach and it may be worth doing. In my mind we could create a Nepomuk profile for "Images and Videos". We could then impelment a Filesystem backend for this and retarget Digikam to use this. In theory Digikam could then have "accounts" (just like an email application has multiple IMAP accounts) and you could plug in a Nepomuk backend for Facebook, Gallery etc. etc. This would be IMO the holy grail implementation and it's this dream that's (in part) causing me not to progress with the work done to date. Hopefully I'll find time to explore the options properly with the main devs, but this approach changes a lot of the fundamentals of Digikam and KIPI as a whole and I feel I'm certainly not qualified or capable (both technically and time wise) to push this approach. Hopefully some of the core devs will take up some of the ideas and either implement them or blow them clean out of the water. Either way it would let me move on!! I have to reply to correct myself. Having been "out of the loop" for a while I've talked myself into misremembering project names etc. I'm totally confused now, as I have posted several messages with incorrect premises relating to nepomuk when it's not relevant to what I had in mind!!! Will have to reread things soon to see where it's at! This is simply not true. You guys forgot Cinepaint. 16 bits color depth is already supported since 0.9.0 stable release, not only current one ! And Krita (with 1.5.0, 11-4-2006). But digikam still rocks! Thanks very much for this - looks much more powerful than f-spot! Just wondering, is it possible to replace the sidebars with the weird text rotated 90 degrees with something better, like an okular-style sidebar? Other than that, the new interface is fantastic! Is it now possible to scale a small image to fit the screen (with anti-aliasing) by default? The gwenview guys seem to not know how this is done and you have to zoom in yourself at every image (very annoying considering collection of >10000 pics) and even so, only at fixed intervals (150%, 200%). THIS IS UNACCEPTABLE. You can add all the maps in the world and still not achieve your core functionality of displaying the damn inages WELL. First, this article is about Digikam, not Gwenview. Second, the tone of your comment is unacceptable. Nobody will want to spend their free time implementing things you shout for, which means you will have to offer your own time to implement it. And, given your incivility, you will then have a hard time finding people prepared to interact with you enough to accept your patch. Are you always this rude to people who give you things for free? Seriously, what personality disorder do you suffer from, precisely, that makes you think this is a) acceptable behaviour, full stop and b) behaviour likely to endear you to the developers you are entreating? We _working_ for Open-Source here. Has lead digiKam developper, i think it's UNACCEPTABLE to read an hurting message like this in this thread! ==> DOT.KDE.ORG need a moderator !! !